I spend so much money every year on my addiction - gardening. This year, I'm trying to be smart and start some of my own. Last fall, I brought into the house three big ice plants that I saved from the year before. These plants have variegated, shiny, waxy leaves and bright red tiny flowers. Of course, I want more to put in my outside containers if and when it ever turns to summer around here. Cut 4-inch pieces of vine with a sharp knife or secateurs. Lay them out in an area of indirect light for a day or so. That gives the cut ends time to callus over. Fill planting containers that have drainage holes with good quality potting soil. Water thoroughly. Pinch off the leaves on the bottom 2 inches of the stem. With a pencil, poke holes in the soil. I put three cuttings in each 4-inch pot. Push the stems into the holes, and press the soil down firmly. Keep the cuttings in a bright area out of direct sun, and that's all there is to it. So easy and cheap! A mystery I can't understand. Blown glass and coloured water can predict the weather! This weather glass was purchased at Home Hardware for $14.95, and it has given me endless enjoyment. It is a sealed glass globe with a tube open at the top. It's all about barometric pressure. 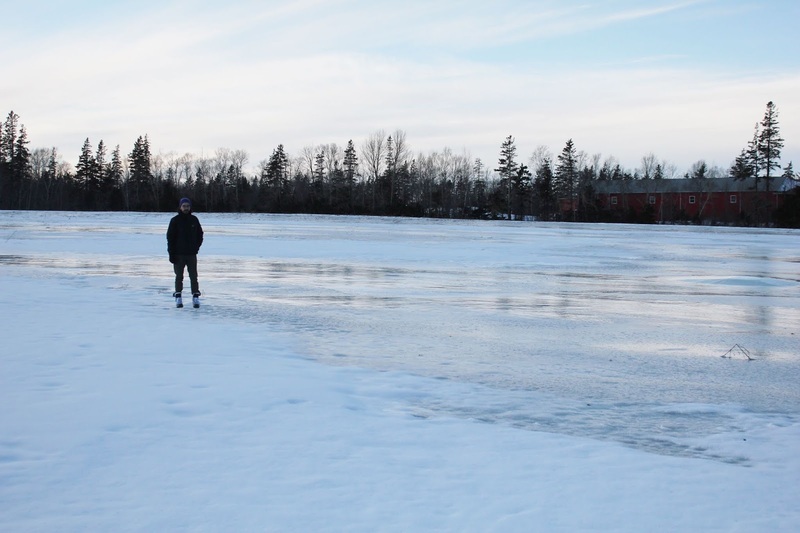 When the weather is turning fair, barometric pressure is high, and it pushes down on the water, making it retreat in the tube. When the pressure is low, the water rises in the tube, in this case, flowing over the top. It means bad weather is on the way. This post has nothing to do with a garden, and nothing to do with me. Our son Dylan the world traveller made a video of himself and his friends skate boarding in Seoul, Cambodia, and Taiwan. 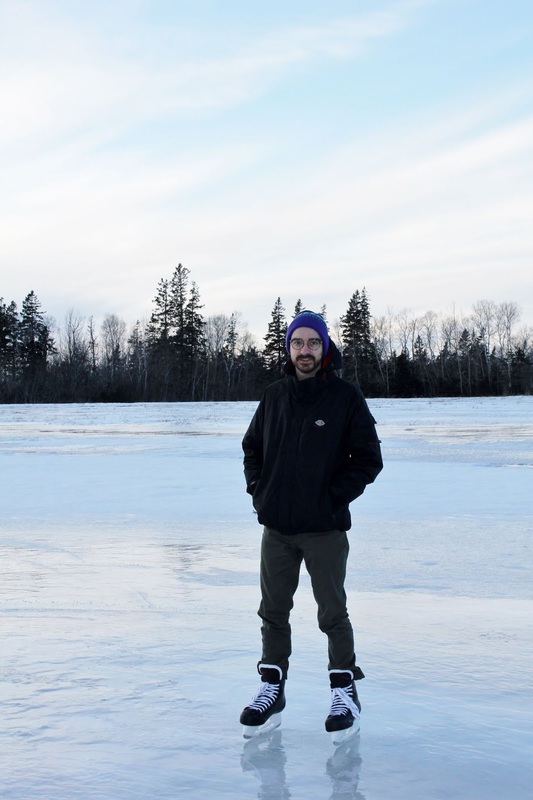 He is back in Canada now, and finding it hard to get his wheels to turn in all that snow. This has been an unusually severe winter. 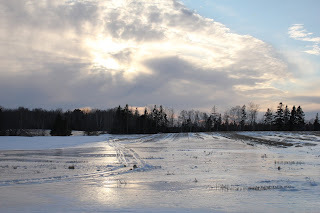 Lots of snow, followed by one-day thaws, followed by -15C, followed by rain. 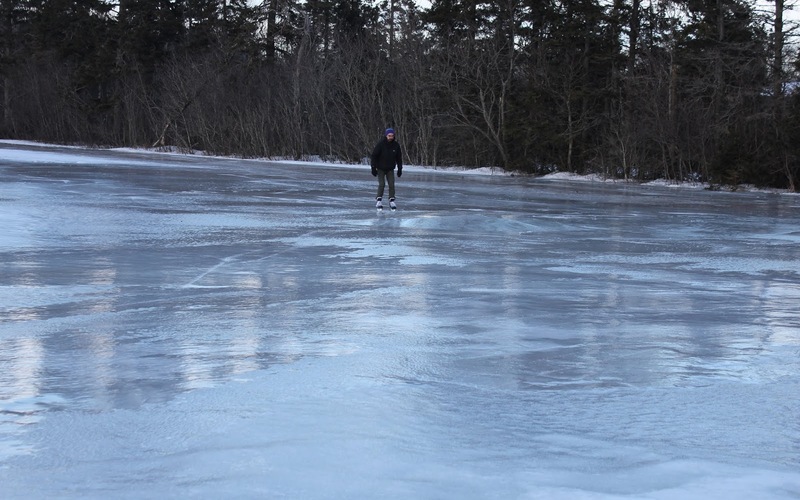 It has made the place a skating rink. Literally in the fields behind my house. 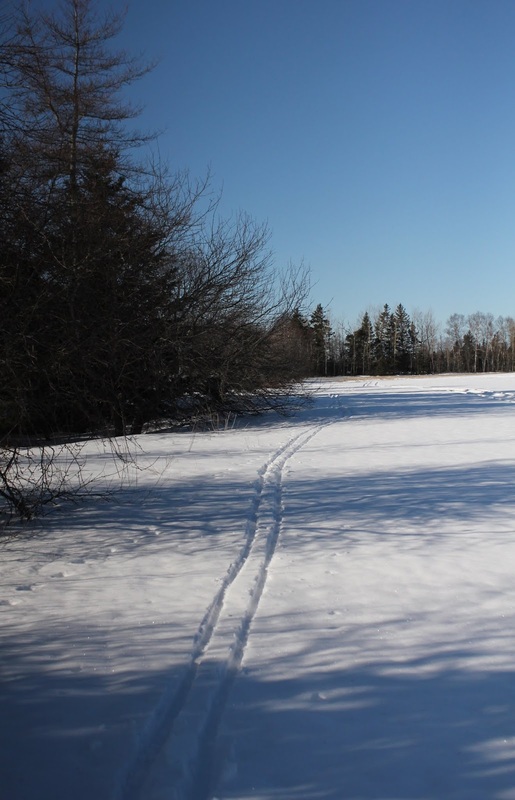 The weather has put a monkey wrench in my cross-country skiing. 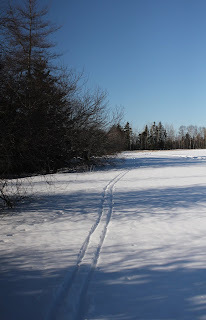 It is so slippery under the coating of powdery snow, I'm afraid to get out there. And there are huge areas I can't cross. So let's make lemonade out of this lemon. Our son Dylan took my negativity and decided it would be perfect skating rink. 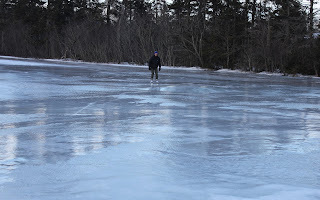 He took out a camp chair to put on his skates, and away he went, exploring the field on his blades. 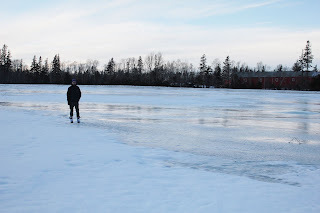 One great thing about this natural rink is that it is directly on the ground - no danger of breaking though and falling into cold water, because the ice is only a few cm thick. I have never had luck growing perennial flowers from seeds indoors. The few seeds that do sprout are leggy and weak. It's too warm on the window sill. 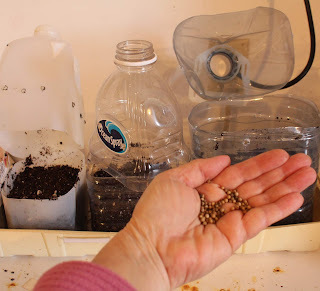 There is a new way to get new plants from seeds without using up precious inside space: winter sowing. We will let Mother Nature provide the light and the water and the space. First, get some plastic jugs. Drill holes in the bottom and along the sides. With an x-acto knife, cut horizontally around the container about 1/3 from the bottom, leaving a few inches uncut on one side to act as a hinge. Take off the screw tops so that rain can get in. 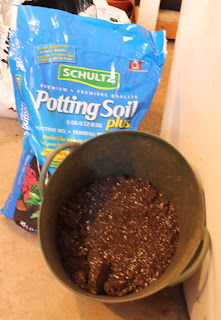 Grab some good quality potting soil. It is much lighter and the little seedlings will be able to push their roots through much more easily than if you use garden soil. 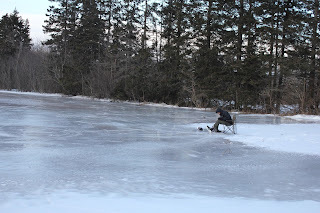 Plus, garden soil is frozen hard as concrete in my yard right now! Add water until it is quite wet. Put at least 4 inches of soil in each jug, and pack down firmly. Choose seeds from plants that grow well in your area and self-seed. 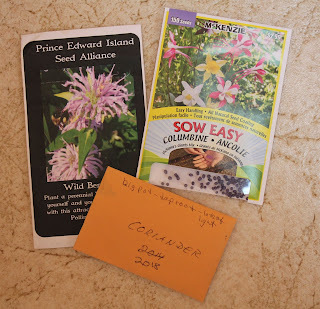 I have chosen coriander, wild bergamont (bee balm), and columbine. I am starting slow, but some people I know have started 90 jugs or more! Here are some coriander seeds, ready to be planted. After setting in the seeds, cover with a thin layer of soil and pat down firmly. 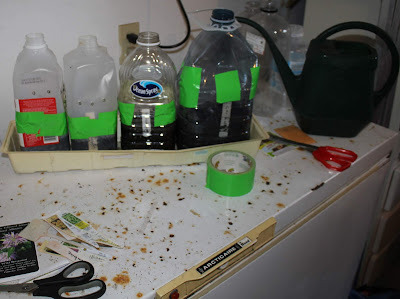 Use a sharpie to write the name of the seed on a plastic label, and push it inside between the soil and the plastic. That way you can easily read the label. Then close the tops over the bottoms and tape the openings shut. 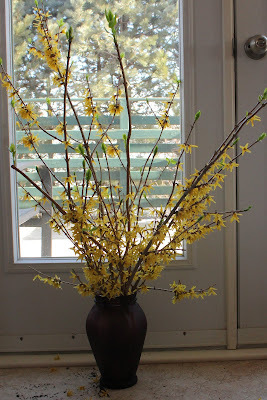 Bring your containers outside and set them in a sunny spot. Mine are in the raised vegetable garden bed. I put a log against the open side to make sure they don't blow over in the wind. Now ignore them until spring. 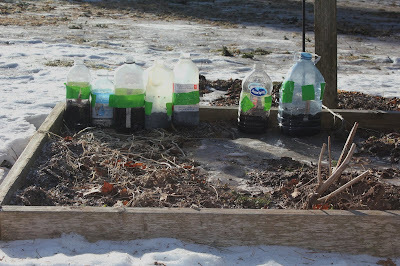 The freezing and thawing cycles will get the seeds ready to pop in spring, and the jugs will act as mini greenhouses to give them a head start. 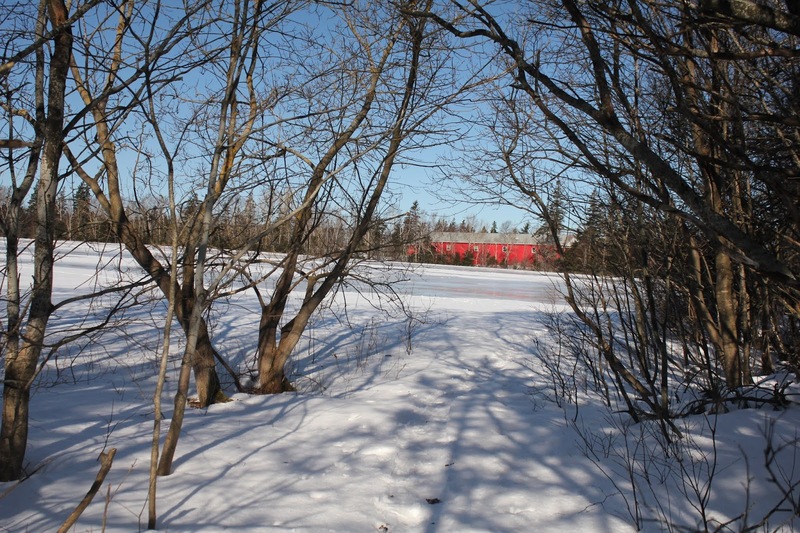 It is -10 celcius and the wind is roaring, but inside, things are blooming! 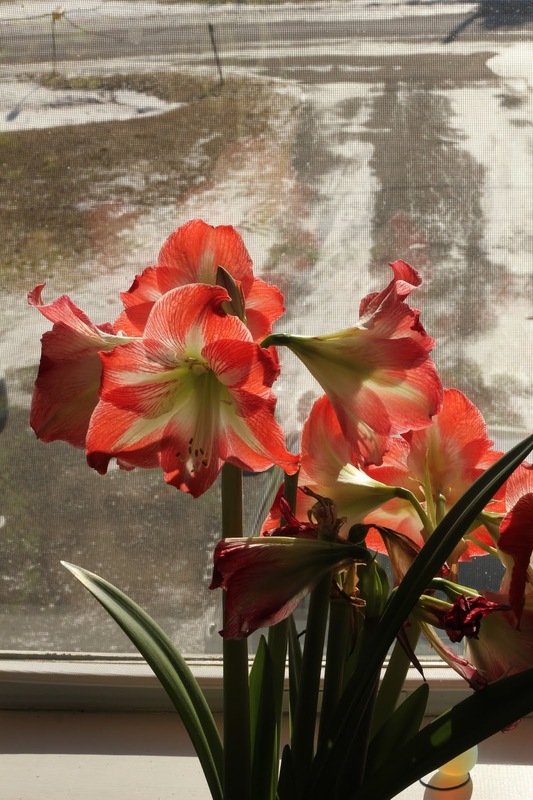 The amaryllis took a long time to get started this year - I bought the bulbs in November, and no life appeared until January - but they are making up for lost time. Two weeks ago, I cut some branches from my forsythia shrub and brought them inside, plunked them into water, and now there is a bit of spring come early in my house! This orchid has been persuaded to reflower many times. My secret is to whip up a batch of lukewarm water, use half as much orchid fertiliser as recommended, fill the entire container with the water and let sit for a half hour. 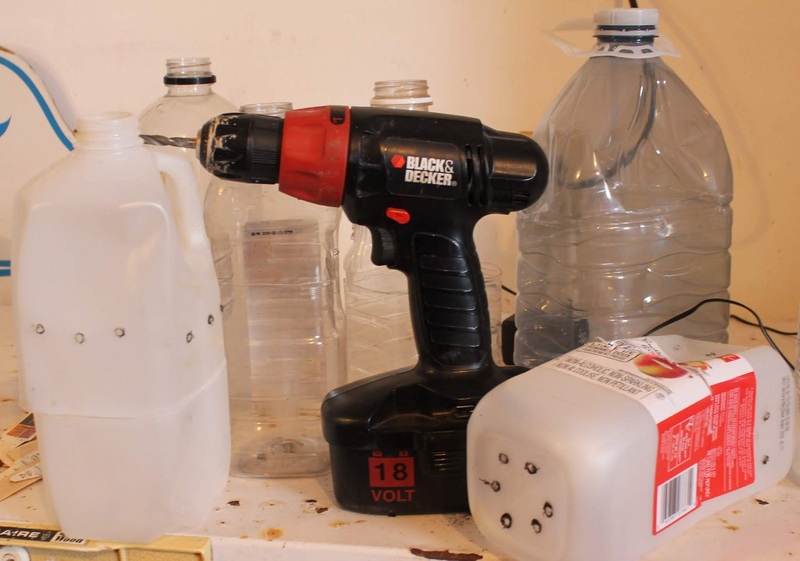 Then drain the water completely, and use it for other plants. Do this once a week, and it will probably work for you too! 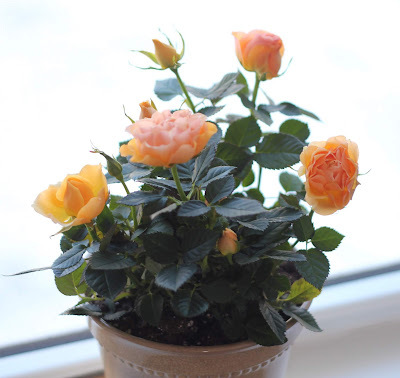 I just brought home this miniature rose, and it looks lovely on the windowsill with snow behind it. When it stops blooming in a few weeks, I will water it sparingly, let it rest, and then in June I will cut it back and plant it outside in a sunny spot. These roses are perfectly hardy and will survive PEI's cold winters year after year. 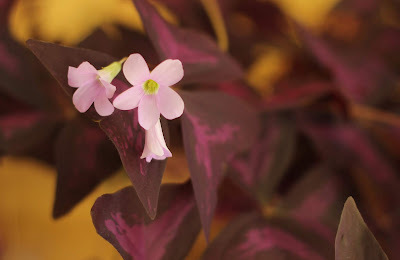 The dainty pale pink flowers of this burgundy shamrock (oxalis) make a great contrast with the leaves. 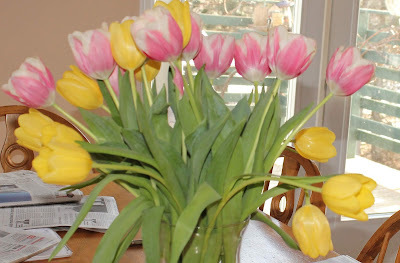 Here are some tulips I bought for my birthday. 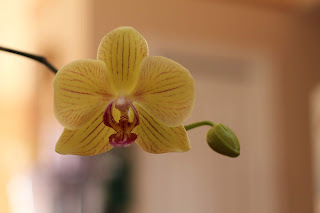 It will be 3 months before the outside ones open their petals. When I was rumaging out in the garage, I was horrified to find this pot of hyacinths I had foolishly left there for almost a year. I had purchased these forced bulbs last year, and I should have planted them outside in the spring. Against all odds, green growth showed between the cracks of dessicated soil that had not been watered for all that time. I brought the pot into the house, and within a week the darlings bloomed and rewarded my negligence with their lovely scent. Nature truly is persistent! Back in October, I accidently left the side garage door open when I grabbed some gardening stuff. When I came back in, I heard some loud rustling and squeaking. Struggling to get out a window it didn't understand was this lovely bird. I couldn't figure out how to get the bird out of the garage. I thought about throwing a blanket over it, but I didn't like the looks of its claws and beak. When my husband Wayne came home, he came up with the obvious: just open the big front garage door. He went around to the outside of the window, gave a little tap on the glass, and the bird finally got the idea. It swooped out the door and into the blue sky. What a treat to see this magnificant bird up close, and I'm so glad all ended happily.